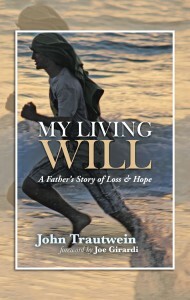 Will To Live Founder, John Trautwein’s inspirational account of his first book signing for “MY LIVING WILL”! It was a cold and snowy late January Saturday evening in Chicago. In fact it was “Super Bowl Eve 2015” and I found myself at an old hangout of mine in my home town of Barrington IL, called Chessies. I was surrounded by some of the oldest and best friends I’ve ever had. They were there to see me and help promote my new book, “MY LIVING WILL: A Father’s Story of Loss and Hope” that had been released just one month before. It was my first book signing of my short career as an author, and old friends, and their families, had come out to see me, purchase my book and simply talk about the old days – a mini-high school reunion of sorts. Several old high school baseball coaches were there, my brother and his friends were there – so many of my high school classmates were there – my life friends – my Life Teammates. My Living Will is the story of my life after the tragic suicide death of my oldest child, my son Will. The book explains how when he died in October of 2010, I thought my life was over – I thought I’d never feel love again- but my family and my friends quickly proved me wrong. They picked me up and not only showed me the good but inspired me to create the non-profit Will To Live Foundation that would inspire teenagers to reach out and recognize the true love they have in their friends today. Life friends – I now refer to them as Life Teammates. So here I was – with my Life Teammates, so many of them, and I was so pleased to be with them. So many hugs and “Love Ya Mans” exclaimed throughout the evening. What made that night very special was the fact it was a blizzard outside. In fact, I would end up being stranded in Chicago for two more days as the snow simply refused to stop falling. A great problem to have – as my brother and I would have a great weekend together, something we had not done for years. Around 8pm that evening, with the snow literally pounding down upon us, I looked around the room at so many old friends, and noticed a new face coming towards me. I had to sit down, I was stunned – I wiped some tears away from my eyes and I notice Tom doing the same. He and I were rival baseball players in high school – some thirty years before. Pretty big time rivals in fact. My senior year at Barrington, as a Pitcher I was 10-2 – ten wins and 2 losses, both losses were to Hersey High and their star pitcher – Mr. Tom Conlin. “I hated that guy” I used to think. I hated him in a way a rival hates someone he can’t seem to beat – but I also respected him because he was very good, and I was almost bummed to find out what a great guy he was when we met at the All Star Game after the season ended. I went on to pitch at Northwestern and he pitched at Notre Dame. Our paths crossed our senior year in college and he beat us, but this time, at least I was not the pitcher. Life Teammates can be on opposing teams…. Up until that moment, for the past four years I’d been preaching to teens about the absolute power they have as “teammates” in all aspects of life, to inspire each other- and as a result improve each other’s will to live. “A compliment from a teammate means more than a compliment from a coach” is a phrase I coined and have said thousands of times. Well, Tom Conlin was never officially a teammate of mine. He was a competitor and a rival who sat in the opposing dugout – and it hit me so hard… Life Teammates goes so far beyond your own team. There is a bond that forms among competitors as well – and Tom and I had proved it. Thirty years later, he came to see me, because he was touched by my story and wanted to show me support, and it meant the world to me that he did. The very next weekend I was back home in GA and had the opportunity to speak to the University of GA and GA Southern University men’s lacrosse teams after their game. They gathered together at mid field after an extremely hard fought- competitive battle loaded with hits, shots, trash talking and shoving – it really was a battle. The whole game I knew I would speak to both teams together and I said to my wife, “Susie – these two teams are killing each other out there – how do I talk about Life Teammates to them – 2 minutes after the game?” Then it hit me – “I’ll talk about Tommy Conlin – that’s what I’ll do”. The speech was a big success and I remember thinking I need to send a note to Tom letting him know that his kind gesture helped me inspire some college athletes. When I got to work that Monday, instead of me writing a letter to Tom – I was stunned to find that in my “inbox” there was a letter from him awaiting me. He thanked me for the book and my efforts and told me a story that I had not heard before that concerned my family. You see, during that season in high school some 35 years ago, despite his team beating us twice during the regular season, in the State Tournament we finally beat them (and Tom who pitched) 1-0 and Tom walked in the winning run to get the loss. He and his teammates then had to watch us all jump on each other because we were heading “down state”. What Tom explained to me thirty-five years later, was something I didn’t know and it moved me. While we were going crazy on the field celebrating, Tom was in the dugout with his hands in his face, so upset for losing such a heartbreaking game that would end his high school season and career. Tom’s not mentioned that while he was sitting by himself so upset, with tears in his eyes, he felt a hand on his shoulder and a strange man he had not seen before said “Hang in there Tom Conlin, you pitched a heck of a game, and you are one excellent pitcher – promise me you’ll keep you head up”. I sat there in my office, once again with tears flowing – and simply said “wow.” I immediately called my dad – we shared a nice memory – a nice thought – and talked about new love from an old friend. In My Living Will – I refer to so many wonderful experiences, conversations and gestures of kindness and love that enabled me and my family to navigate through an unbelievable grieving process that we faced with the death of our Will. My first book signing gave me not only another chapter for my story, but a reconnection with a Life Teammate that I didn’t know I had. It enabled me to find another source of love and hope in my life and as a good friend once taught me – love heals. ← Team WTL Lacrosse Plays Turkey Shootout! You’re dad is an amazing man,and the apple doesn’t fall far from the tree John. Beautiful story. It never ceases to amaze me how complete tragedy often leads us to beauty unseen and while in this case I know you’d trade it all away to change things back, the mystery of God’s great grace is still empowering. Love ya man!